The most important tourist sights are within the walking distance- Via Garibaldi, Palazzo Rosso, Palazzo Ducale, the Church of San Siro, Theatre of Carlo Felice, the university of Genoa and the Old Port where one can take a ferry to visit the famous Cinque Terre. The historic centre offers also many shopping and catering options. Check in 2:00 p.m. - 7:00 p.m. hours. Excellent location, a free weekend minutes walk from the harbour and the city centre. Great Base to explore Genoa. And I recommend the bakers for breakfast that is just round the corner on the narrow streets heading towards the aquarium. Good value for money and an excellent location in the historical centre of the town. I was very satisfied with it. Not luxurious, but a good standard of cleanliness. The staff were helpful and friendly. You need to know that there is no service after 19.00. It is a hotel and not a hostel, so your chances of meeting a fellow traveller are limited. Great location (maybe 10ish minute walk from the station), clean facilities, and nice staff. No hostel atmosphere though as it was hard to meet people as a solo traveler. Good location. Walking distance to train station and centre. Very clean and very nice staff! Nothing much to complain about. Very central location, generally nice room and friendly receptionist. Although folding bathroom door did not close entirely and hence did not give much privacy. Mini Hotel is a bit essential, being a hotel not recently refurbished. The reception is closed from 7 pm to 7 am. It is good value for money. 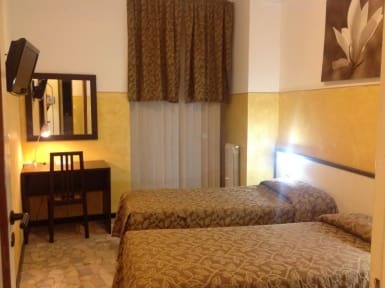 It is 10 min by foot from the train station P.za Principe and very close to the main attractions in the historic centre. The street itself in which it is located offers good places for food and a lot of shops; the downside is that it is a bit noisy since our window was not double glazed. Rooms are clean, wifi and television are included. I stayed in one of the rooms with shares toilet. It was nice and clean. The check-in time is very strict (not even 10 mins past 7 was accepted), but if you contact ahead of time they can make an arrangement for you to get in. My room was large, but it had a very small single bed (more like half the width of a single bed). There is definitely space to put a twin/double bed, which would make it much comfortable to sleep. Overall I liked the place. 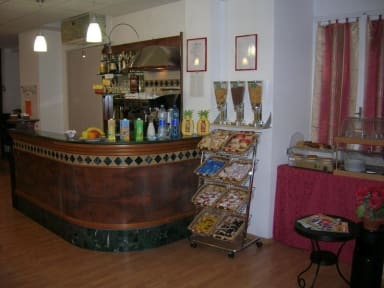 A small, clean hotel with pleasant staff But located in a narrow street in the old town. Consequently the room was overshadowed and dark, and very noisy because of the sounds from the street below.